Policy tours are a great way to see and experience more of B.C. while you are in Whistler for the Summit. Sign up for policy tours when you register. If you've already registered, you can still go back and edit your registration! Pemberton Distillery is a boutique family owned and operated craft distillery set in the heart of the spectacular Coast Mountains of British Columbia, Canada. 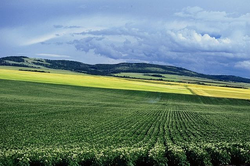 Our mission is to capture the distinct terroir of this beautiful agricultural region in the highest quality sipping spirits. From award-winning organic potato vodka and gin to barrel-aged whisky and brandy, every spirit is personally handcrafted by Master Distiller and owner Tyler Schramm using traditional craft methods and hand-operated copper pot stills. 1.5 hour private distillery tour for 25 guests led by owner and master distiller Tyler Schramm (MSc Brewing and Distilling Canada's Top 40 Foodies Under 40, Popular Mechanics Top 5 of the World's Most High Tech Distilleries). Behind the scenes in-depth tour through the entire production of craft distilled spirits: selecting locally grown raw materials, preparing a natural mash and fermentation, traditional copper-pot distilling by hand, barrel aging, bottling. Join PNWER on Thursday, July 24 for an all-day trip to Vancouver. The tour will begin at Port Metro Vancouver at 11:00 am. Port Metro Vancouver is North America's largest export port by tonnage and Canada’s largest gateway, handling 19% of Canada’s total goods trade. Port Metro Vancouver has demonstrated environmental leadership through programs and initiatives such as Northwest Port Clean Air Strategy, habitat enhancement, shore power for cruise ships, and the award-winning EcoAction program. 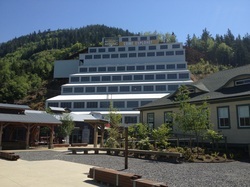 The tour will then visit the Belmont Building which is a building redesigned by RDH Building Engineering Ltd. who turned it into an energy efficient building that has received many different awards such as the Sustainability Award, the first ever Technical Achievement Award from the Canadian Green Building Council and Sustainable Architecture & Building Magazine, and the Project of the Year Award from Fenestration Association of BC. Our last stop will be visiting the new Sony Headquarters in downtown Vancouver. Sony Pictures Imageworks is moving its headquarters from Culver City, California to downtown Vancouver’s Pacific Centre and we will be some of the first to see the new building. Attendees may travel by rental car or the group bus. The bus will drop off participants at Canada Place in downtown Vancouver at 5:00 pm. The Britannia Mine operated from 1904 to 1974 and was once the largest copper mine in the British Empire. We will have a chance to tour the Britannia Mine with a 45-minute Mine Tunnel and Mill Guided Public Tour. A train ride takes you into the atmospheric early-haulage mine tunnel while their Interpreter explains the miners’ working conditions and demonstrates the drills and equipment in the early 20th century. After that, you will continue into the Mill, an impressive structure, dramatic industrial interior that was built into the mountain-side and one of the last gravity-fed Mills in North America. After the guided public tour, you will be able to explore the exhibits around the site. You will even get a chance to try gold panning and watch the informative 15 minute documentary Groundbreaking – The Britannia Story – in the Theatre. We will also have the opportunity to see environmental remediation in practice. The tour Interpreter explains the historical acid rock drainage problem while showing the equipment in operation and describes how the water from the mine tunnels has been rerouted and diverted to the equipment at the Water Treatment Plant. With a hands-on replication of the process, you can see how water is treated and cleansed of toxic minerals, prior to being discharged into Howe Sound. 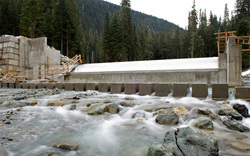 Join PNWER on Thursday, July 24 to take a tour of the Fitzsimmons Creek Renewable Energy Project. This project is a partnership between Ledcor and Innergex Renewable Energy to create a run-of-river plant that harnesses energy from Fitzsimmons Creek. 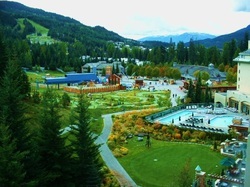 It was constructed in 2010 and is located entirely within Whistler Blackcomb’s operating area. The project has a single turbine with a capacity of 7.9 megawatts and produces 33 gigawatt hours of hydroelectricity per year - the equivalent of powering the ski resort’s winter and summer operations including 38 lifts, 17 restaurants, 270 snowguns and countless other buildings and services. Recently, Whistler Blackcomb was awarded the Golden Eagle Award for Overall Environmental Excellence at the 2010 National Ski Areas Association (NSAA) National Convention and Tradeshow. This is great opportunity to learn about what a run-of-river project is and how it works. We will be meeting at the Fitzsimmons powerhouse and taking a tour of the intake and then have short Q&A session to learn more about the run-of-river project and the environmental consideration that goes into building one of these projects. Please wear appropriate footwear (no heels or open-toed shoes). This all day tour will take us to a number of places including the Krause Berry Farm, Seabreeze Farm, and Houwelings Greenhouses. We will end in downtown Vancouver, BC for an easy transition home. Our first stop is the Krause Berry farm where we will enjoy fresh berries and explore the estate winery. Krause farm started with 1 acre of strawberries in 1974 and has now grown to over 200 acres producing a variety of berries and vegetables. This farm has adopted new agricultural technologies such as the Integrated Pest Management and is actively involved in agricultural research to find the best possible farming techniques. After our tour of the Krause Berry Farm, we will travel to Delta, BC to visit the Seabreeze Farm, where we can learn more about anaerobic digestion facilities and nutrient recovery systems. Afterward, we’ll take a trip to Houweling’s farm, a family owned, world-renowned greenhouse tomato grower. This farm is dedicated to delivering a full complement of delicious tomatoes, while continually innovating to reduce its environmental footprint. After we finish up at all the farms we will end in downtown Vancouver. Join us on a walking tour to explore the Resort Municipality of Whistler's impressive strides in environmental stewardship. Stroll around beautiful Whistler while also learning about the municipality's innovative sustainability initiatives targeting energy efficiency promotion and greenhouse gas emission reductions. After a welcome from Mayor Wilhelm-Morden, we will walk to the Squamish Lil'wat Cultural Centre Pit House to discuss the area's historic green building strategies. We will then take a tour of the PassivHaus, a modern building with state-of-the-art energy efficiency systems and methods that housed the Winter Olympic Austrian team in 2010. After that we will gather at the LEED certified Whistler Public Library and hear an overview of the Meadow Parks Sport Centre Solar and geo-exchange business case and the Cheakamus Crossing District Energy System. Combine this tour with the Fitzsimmons Creek Hydroelectric Tour later in the afternoon. Monday, July 21, 6:30 p.m. – 8 p.m. The group will travel via the Whistler Village Gondola to the Roundhouse Lodge, which is located at a spectacular 6,069 ft. / 1,850 m. above sea level at the top of Whistler Mountain. To participate in this networking event, please mark the Monday evening reception in your registration. Paired with some of the best catering Whistler has to offer and served among the largest collection of Squamish and Líl’wat native art and exhibits — the SLCC is the perfect venue for a reception. Beyond the culinary experiences, atmosphere and incredible architectural design, it is the staff and exhibits at the Squamish Lil’wat Cultural Centre that create a perfectly unique evening. To participate, please mark the Wednesday evening reception in your registration.